But before onCreate is called and splash appears, there is small amount of time when action bar shown. How can I make action bar invisible? but in that case getActionBar() always returns null and I found no way to show it again. This creates the ActionBar and immediately hides it before it had the chance to be displayed. But now there is another problem. After putting windowActionBar="false" in the theme, the Activity draws its normal Window Title instead of an ActionBar. If we try to avoid this by using some of the *.NoTitleBar stock themes or we try to put <item name="android:windowNoTitle">true</item> in our own theme, it won't work. The reason is that the ActionBar depends on the Window Title to display itself - that is the ActionBar is a transformed Window Title. This will make the Window Title with zero height, thus practically invisible . and you are done. The Activity will start with no ActionBar flickering, nor Window Title showing. but it may need some extra logic to check if this is the first showing of the Activity. The idea is to delay a little the hiding of the ActionBar. In a way we let the ActionBar be shown, but then hide it immediately. Thus we go beyond the first non-animated showing and next showing will be considered second, thus it will be animated. As you may have guessed there is a chance that the ActionBar could be seen before it has been hidden by the delayed operation. This is actually the case. Most of the time nothing is seen but yet, once in a while, you can see the ActionBar flicker for a split second. In any case this is not a pretty solution, so I welcome any suggestions. Set AppThemeNoBar as application theme and AppThemeBar to the activity where you want to show the ActionBar.﻿ Using two styles you wont see the Action bar while views are loading. into android:theme="@style/Theme.AppCompat.NoActionBar"and it worked, but the the Interface was dark. then i tried android:theme="@style/Theme.AppCompat.Light.NoActionBar" and finally got what i wanted. After that when I Searched about 'AppCompat' on Developer Site I got This. And Sorry for my bad English Like Always. Best result to me was to create an activity with ThemeNoTitleBar and without content as launcher. Then this activity call directly to the other. Of course if you want you can add content to the Splash Activity but in my case I just wanted to show application directly. It should be the same with native ActionBar of Android. @Clerics solution works. But this appears to also be an issue with some of googles native apps: googles, play store, talk. Also other big apps like skype. 2015, using support v7 library with AppCompat theme, set this theme for your Activity. // without this check, we would create a new fragment at each orientation change! The best way I find after reading all the available options is set main theme without ActionBar and then set up MyTheme in code in parent of all Activity. This way helps me to avoid ActionBar when application start! In case you have null because you are using the support library, instead of getActionBar() you need to call getSupportActionBar(). As a special case, if you call startActivityForResult() with a requestCode >= 0 during the initial onCreate(Bundle savedInstanceState)/onResume() of your activity, then your window will not be displayed until a result is returned back from the started activity. This is to avoid visible flickering when redirecting to another activity. You should probably do this only if the argument to onCreate is null (indicating a fresh launch of your activity, as opposed to a restart due to a configuration change). Actually, you could simply set splash Activity with NoActionBar and set your main activity with action bar. 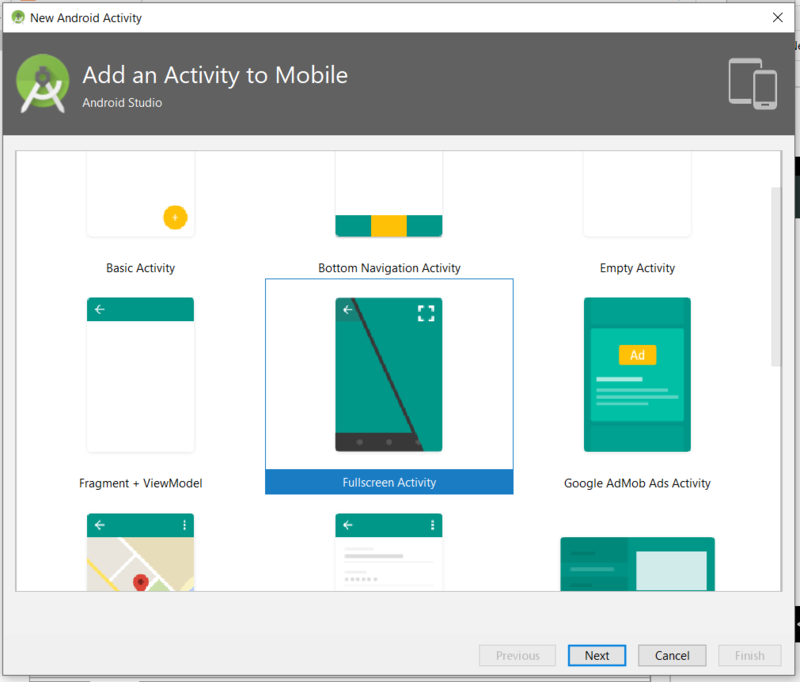 Android studio provide in build template for full screen, if you use Android studio you can follow below step to implement full screen activity. Done. 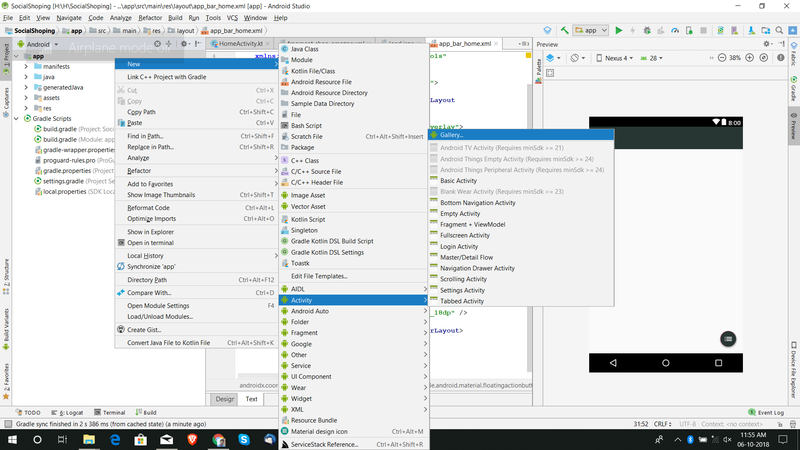 Android studio did your job, now you can check code for full screen. I realise that posting links are not the best way to do things, but I highly recommend you read the following documentation from Google themselves. This is the official android doc on how to control your system ui (things like actionbar, nav bar etc). Unfortunately the info is too much to post directly, but after reading this you will understand exactly how to show and hide features no matter what version you are developing for, its so simple! in your directory = res/values/style.xml , open style.xml -> there is attribute parent change to parent="Theme.AppCompat.Light.DarkActionBar"
if all of it doesn't work too. i don't know anymore. but for me it works. Not the answer you're looking for? Browse other questions tagged android android-3.0-honeycomb android-actionbar or ask your own question. How to hide the actionbar before the Activity is loaded? Android- hide actionbar during startup and then show it again? How to create Android application without ActionBar using new theme in API9? How to make full size view when using TextureView in android?